U.S. service companies grew more slowly last month. Retail sales figures were disappointing. And central banks in Europe and China cut their interest rates, an indication that they expect weaker growth ahead. WASHINGTON — The outlook for the U.S. job market brightened a little today after the government said fewer people applied for unemployment benefits last week and surveys of private companies showed hiring increased in June. The economy is still far from healthy. U.S. service companies grew more slowly last month. Retail sales figures were disappointing. And central banks in Europe and China cut their interest rates, an indication that they expect weaker growth ahead. But despite all the gloom, American factories and service firms kept hiring in June. Economists say that suggests many companies are less worried that the spring slump will endure. “It is beginning to look like the labor market is not nearly as weak as feared,” Joel Naroff, chief economist at Naroff Economic Advisors, said in a note to clients. Wall Street was mixed in light of the latest economic reports. Stocks fell early but recovered much of their losses by midday. Bad news from Europe was offset by higher expectations for June job growth, which the government will report on Friday. The economy added an average of just 73,000 jobs a month in April and May. That’s much lower than the 226,000 a month that were added in the first three months of the year. And it’s far too low to reduce the unemployment rate, which rose to 8.2 percent in May. Before today, most economists didn’t expect much change from that pace. They forecast that employers added 90,000 jobs last month, while the unemployment rate didn’t change, according to a survey by Factset. But several sounded slightly more optimistic after seeing a slate of better data. Weekly unemployment benefit applications dropped by 14,000 to a seasonally adjusted 374,000, the Labor Department said today. That’s the fewest since the week of May 19. Payroll provider ADP said businesses added 176,000 jobs last month. That’s better than the revised total of 136,000 jobs it reported for May and, if sustained, would be enough to lower the unemployment rate. Goldman Sachs responded to the better data by raising its forecast to a gain of 125,000 jobs last month, up from its initial prediction of 75,000. Brian Bethune, chief economist for Alpha Economic Foresights LLC, said he expects job growth of 120,000 to 140,000. But he warned that even those figures were too weak to bring down unemployment. Economists typically say it takes at least 125,000 new jobs each month to absorb population growth. A report on U.S. service companies, which employ 90 percent of workers in the economy, illustrated that point. The Institute for Supply Management said its index of non-manufacturing sector growth fell last month to 52.1. That’s down from 53.7 in May and the lowest reading since January 2010. Still, any reading above 50 signals growth. The sector has been growing since December 2009. The report covers a range of businesses, from retail stores and restaurants to health care companies and financial services firms. Even though growth slowed in June, those firms increased hiring. An index that measures employment rose in June to 52.3 from 50.8 in May. Earlier in the week, a separate ISM survey of factory activity showed manufacturing shrank in June for the first time since July 2009, one month after the Great Recession ended. Yet that survey also noted that hiring at factories remained at a healthy level. The contrast between the weak readings on overall growth and solid readings on hiring indicates companies aren’t worried about a major slowdown. The ISM reports suggest that firms may not view slower output and softer demand “as sufficient to alter hiring plans,” said Michael Gapen, an economist at Barclays Capital. Companies are also planning fewer layoffs, according to a survey by Challenger, Gray & Christmas, a firm that helps find laid-off workers new jobs. U.S. employers announced 37,551 job cuts last month, the fewest in 13 months,the survey said today. Despite recent signs that the economy is slowing, “employers appear reluctant to shed too many workers,” said John Challenger, CEO of the firm. The ADP survey has often deviated sharply from the government report, so economists approached the June results with some caution. The ADP report only covers hiring in the private sector and excludes government job growth. Other economic reports have been disappointing. 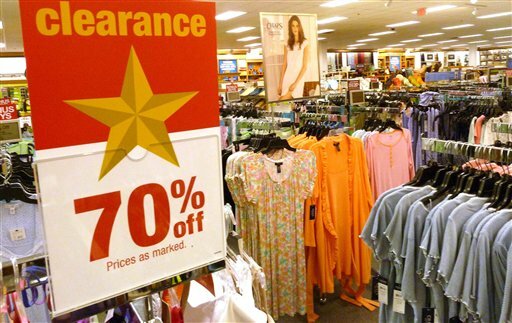 Retailers are reporting weak sales for June as worries about the economy and jobs make people pull back on spending. The results raise concerns about Americans’ ability to spend for the back-to-school shopping season. Costco Wholesale Corp. reported a gain below Wall Street expectations. Target Corp. also missed estimates, posting a modest increase. Teen retailer Wet Seal Inc. reported a bigger-than-anticipated decline. And Europe’s debt crisis is a constant threat to the U.S. economy. The European Central Bank cut its key interest rate by a quarter-point to a record low 0.75 percent in an effort to boost Europe’s flagging economy. The central bank also cut the rate it pays to commercial banks on overnight deposits to zero. That is intended to push banks to lend more rather than hold reserves at the ECB. In addition, Mario Draghi, president of the ECB, said the economy in the 17 nations that use the euro would recover only gradually and the risks “continue to be on the downside.” He also suggested the interest rate cut would only have a limited impact on the economy. Meanwhile, China’s central bank cut a key lending rate for the second time in a month. The world’s second-largest economy is battling its worst economic slump since the 2008 financial crisis. China’s economy expanded at an 8.1 percent annual pace in the first three months of the year, runaway growth in most countries, but the slowest in nearly three years in China.